Posters produced to advertise railway companies and their destinations were not expected to last longer than their brief period of display. The papers on which they were printed contained low quality wood pulp and the inks were bulked out with cheap extenders. They were pasted to billboards and walls and often torn down or covered with next season’s designs. Although they were mass produced, the fact that examples from the nineteenth century had survived at all is remarkable. Once such example was almost lost when, after nearly being thrown out due to its poor condition, it was donated to a local charity shop who contacted the National Railway Museum. 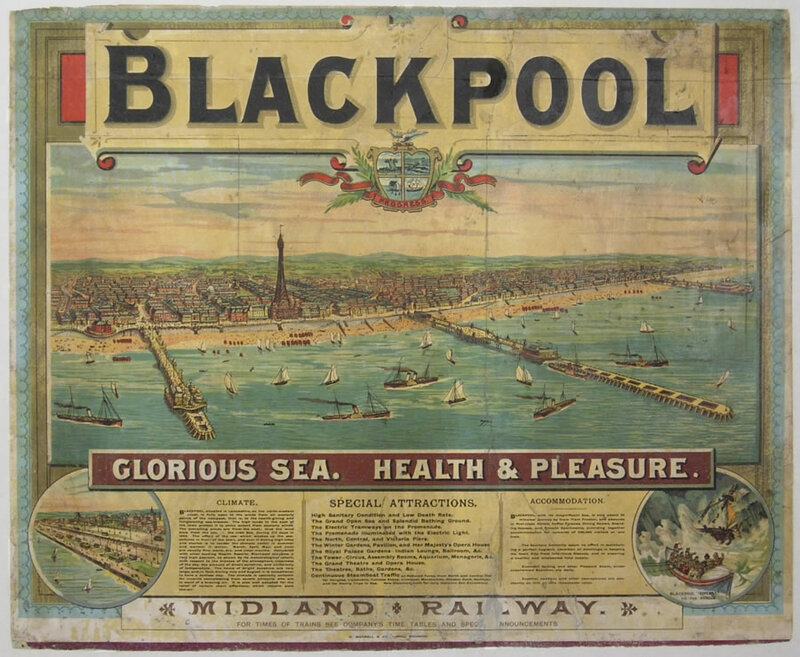 The poster was used by the Midland Railway to advertise the growing Victorian holiday resort of Blackpool. 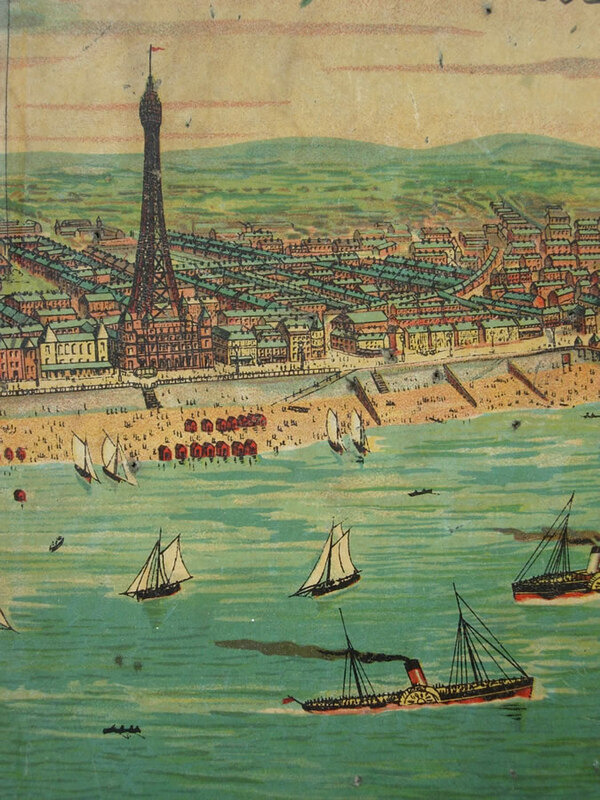 Although similar to a larger version already in the collection, this poster includes the newly built Blackpool Tower, erected in 1894 to emulate the Eiffel Tower. 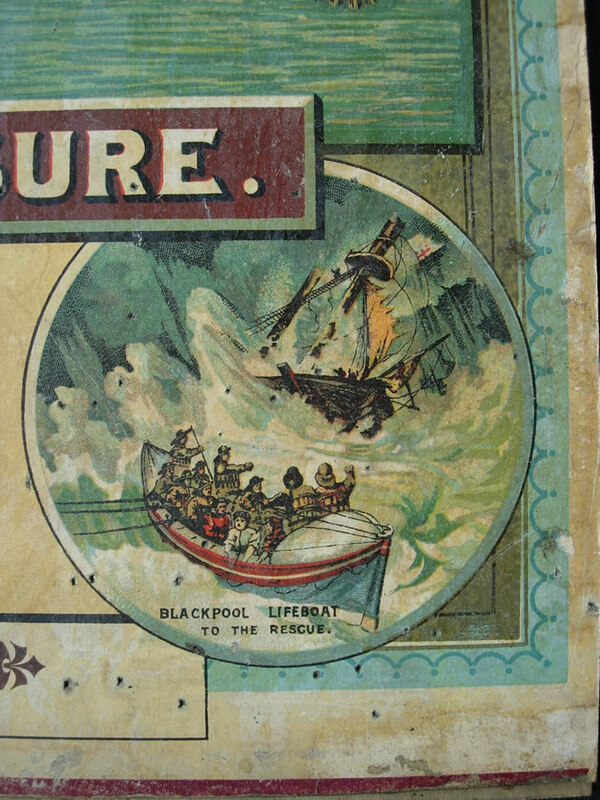 It shows a panorama of the seafront at Blackpool, bustling with the activity around bathing carriages and steamers off the piers. 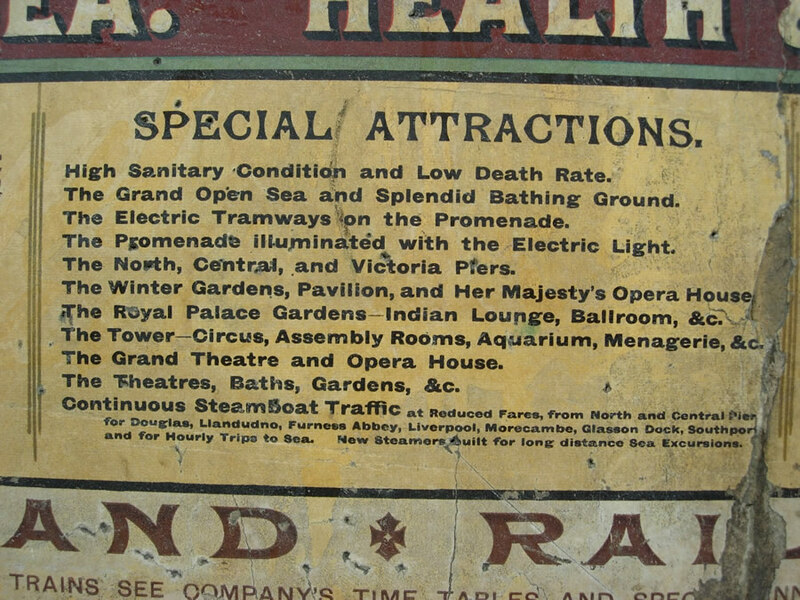 Top of the list of the resort’s special attractions is its ‘High Sanitary Condition and Low Death Rate’! It had clearly had something of a hard life, having been pasted down onto a straw-fibreboard and coated with thick varnish. Cut marks and pin holes suggest it may have found a later use as a notice board and a cutting mat. Later still, split in two and covered with a layer of surface grime, the poster was stuck down on plywood and placed in a frame. 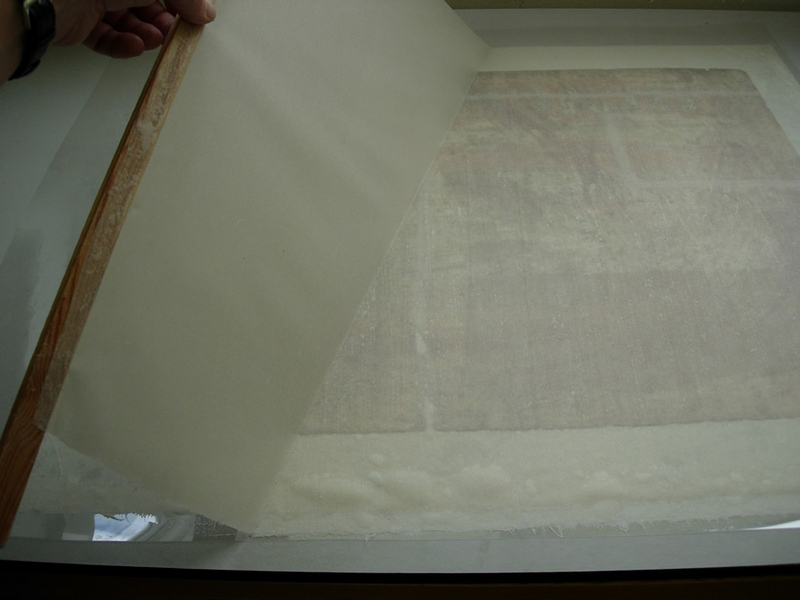 This was the condition in which the poster arrived for conservation this summer. Initially, the solubility of the varnish layer, probably shellac, was tested with a range of solvents. Although it was found to be soluble in a number of these, including alcohol and acetone, several of the inks and their binder were also sensitive to these. 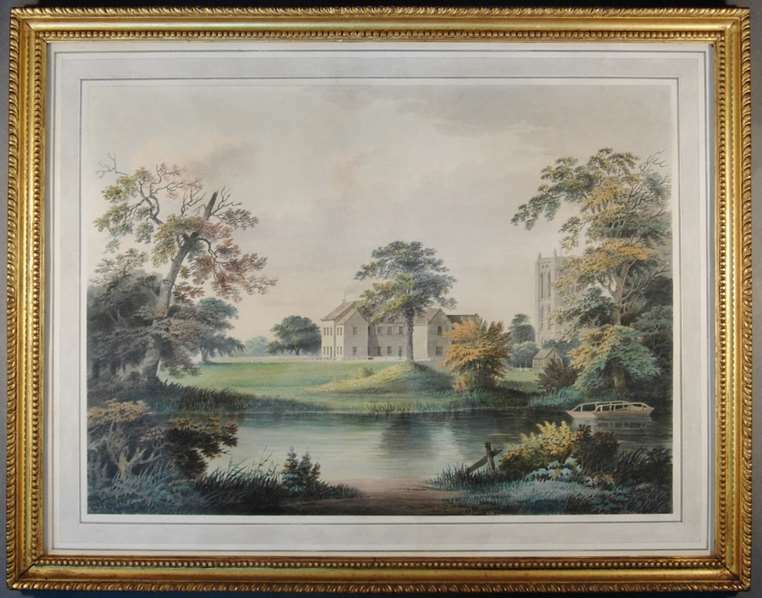 Therefore, the varnish could not be removed but it was possible to clean away much of the accumulated dirt and grime from the surface using a chelating agent, tri-ammonium citrate, commonly used in easel painting conservation. 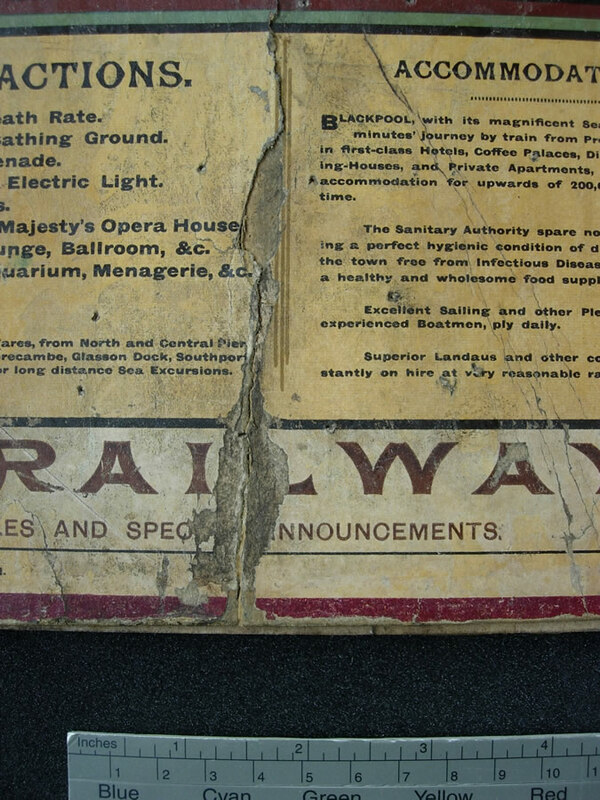 In order to clean and repair the poster more fully, it was essential to remove the later backings of strawboard and plywood. The paper on which the poster was printed was very thin and brittle, so this was going to be a painstaking process. Using a long palette knife, the strawboard was separated from the plywood. Then, with the poster face down, the strawboard layer was gradually thinned down using a scalpel to get close to the adhesive layer. Despite the varnish layer, it was possible to wash the poster by immersion in water. 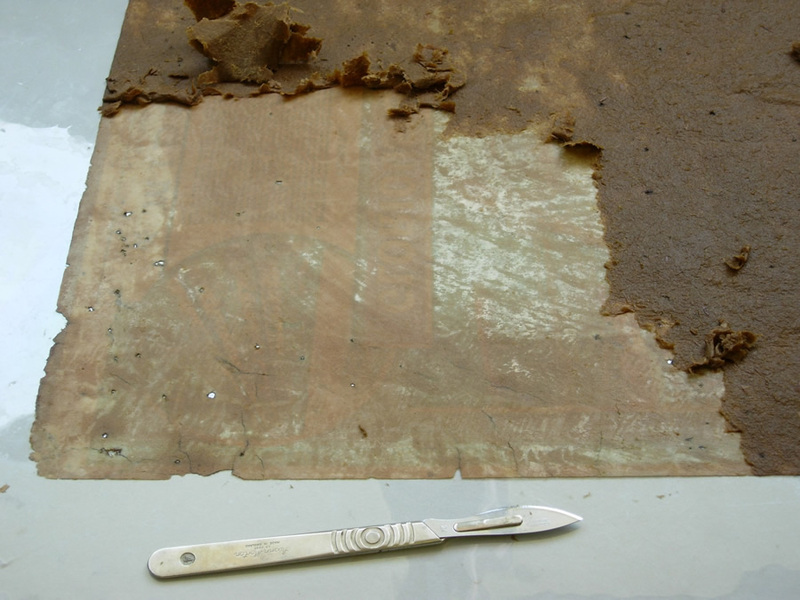 This not only helped remove the remaining backing layer and adhesive but also washed out soluble discolouration and helped to raise the pH of the paper by adding calcium hydroxide to the water. 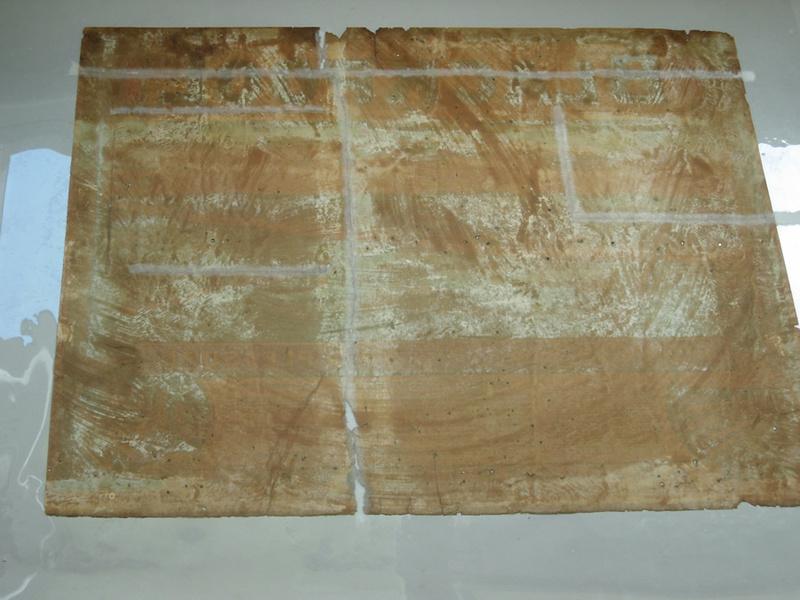 Repair work was carried out using strips of Japanese paper, a soft, long-fibred paper good for spanning tears, which were attached with wheat starch paste. To give the poster back its overall dimensional stability the repaired poster was lined with a sheet of Japanese kozo paper before flattening. Losses were filled with a matching Western paper and, along with small losses to the ink, these were toned with watercolours to unite the image. Finally, the poster was placed for its protection into a clear, inert polyester sleeve for storage. Thus this rare survivor from the golden age of Victorian resorts, made accessible by the railway, has been saved from the brink and preserved for the future.